We have lost a fellow Questing Heirs genealogist this month. 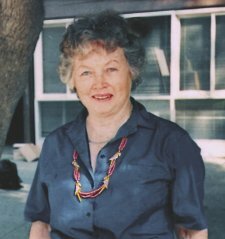 Mabelle Elnora Collum Little, who was born in Oklahoma on January 26, 1921, died of multiple myeloma on March 5, 2005, in her daughter’s home in Simi Valley, California. At various times, she served our society as Newsletter Editor (for several years), was Ways and Means Chair, a Member-at-Large on the Board, and a coordinator for our Everton Seminar some years ago. The only child of Elnora Cumbie and Carroll Collum, she spent her early years in the southern states of America. That fact was evident in her congeniality and her soft-spoken demeanor. It was a point of delight to her to belong to the United Daughters of the Confederacy! Intellectual curiosity was her trademark, and she sought out unusual items, places to visit, things to learn. Mabelle had an insatiable interest in topics of every scope, an eclectic collection of books, all of which she had read, much of which she remembered. Her vast knowledge was invaluable to those of us who were fortunate enough to know her. I never knew what she would suggest we do, see, or visit! Mabelle belonged to Questing Heirs Genealogical Society and Conejo Valley Genealogical Society. She enjoyed her trips to search out family roots, but genealogy was only one of many of Mabelle’s interests. At this last stage of her life, she was fully engaged in her church, in her wisdom group, a couple of book clubs, and The Red Hat Society. Living in her daughter’s home, a hub of family gathering, enabled Mabelle to have a dynamic rapport with other of her family’s generations, and her presence favorably impressed everyone. There is a void where Mabelle used to be, but I’m sure she’s scooting around, searching out and questioning all those relatives who predeceased her. Solving a puzzle was to Mabelle as waving a red flag is to el toro! She’s putting it all together, I’m sure. But I miss her. Mabelle died peacefully on March 5, 2005, in the Simi Valley home of her eldest daughter, surrounded by her loving family. Born in Oklahoma City January 26, 1921, she married her high-school sweetheart, Robert E. Jones. They moved to Long Beach after WWII. A car accident took Bob from her in 1966. She later married Harold Little and was widowed again in 1989. Her essence was a combination of warmth, humor, intelligence, openness, curiosity, and a genuine appreciation of each individual. Mabelle is survived by daughters Sage Collum and Frances O’Neill, son-in-law Russ O’Neill, grandchildren Cathy Thomas, Steve ONeill, Mike ONeill, Aurora Salazar, and Lee Salazar, and five great grandchildren. The memorial service will be Sat., Mar. 19, at 2 PM in the One Spirit Center for Conscious Living, 1756 Erringer Road, #100, Simi Valley. Donations may be made to the Alzheimer’s Association, 1339 Del Norte Road, Camarillo, CA 93010.